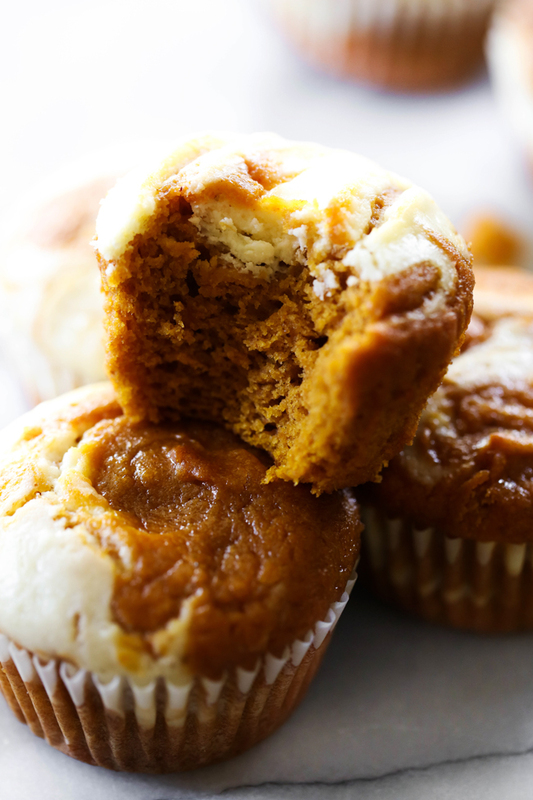 These Pumpkin Cream Cheese Muffins are moist and have the perfect fall flavor. The pumpkin portion and the cream cheese portion swirl together to make a beautiful and tasty treat. These are absolutely delicious and will be a new fall favorite. Fall is here and I am SO excited. I love everything about fall. The sweaters, cardigans, spices, food, trees… I love it all. Fall baking has begun and I LOVE how it makes my house smell. 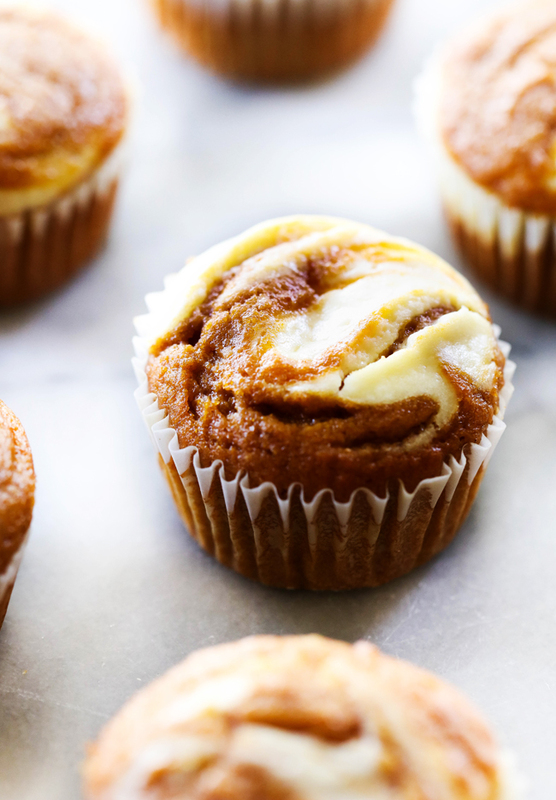 These Pumpkin Cream Cheese Muffins are divine. They are so moist and delicious and were gobbled up by each member of my family. The pumpkin and cream cheese come together seamlessly and create not only a gorgeous display, but an outstanding taste. If you are looking for the perfect addition to your fall baking, give these a try! They do not disappoint! In a large mixing bowl, mix together sugar, brown sugar, pumpkin, eggs, oil, and vanilla. In a separate bowl, sift together flour, baking soda, salt, cinnamon, ginger, and nutmeg. Slowly add to pumpkin mixture. Mix until just combined, do not over mix. In a medium bowl, beat together cream cheese, sugar, egg, and vanilla. Mix until smooth and creamy. Fill muffins ¾ of the way full. Add 1 Tablespoon of the cream cheese mixture to each muffin. Add about a ½ teaspoon of the pumpkin batter over the top of cream cheese mixture. Bake muffins for 17 to 20 minutes. Check for doneness by inserting toothpick and if it comes out clean, they are done. About how many muffins does this recipe make? They are wonderful! Makes 12 muffins that don't drop when cooled. I may have mixed both the pumkin mix and cream cheese mix up too much, but it doesn't matter in the end. Just cook until the toothpick comes out clean. Also, make sure you bake in a oiled up custard cup anything left in the mixing bowls. It is a wonderful treat for the cook! We LOVED it! The only change I made was to use boneless, skinless chicken thighs. Breast meat is too dry for me. (For some reason I don’t seem to be able to rate this recipe but I give it 5 stars!